I’ve been contemplating the placement of my right thumb as of late. It’s always been a bit too far to the left, instead of under the fingers where it is reportedly supposed to go. I’ve never thought much of it. Until today. After struggling for some time with smoothing out and speeding up some fast passages, I felt frustrated. Seriously – how long have I been playing these notes, and my technique is still sloppy, despite my efforts? Argh. On a whim, I moved my left thumb about 3/4 inch to the right, so it was more under the index and middle fingers of my right hand. And suddenly I could play it all. Patricia George and Phyllis Avidan Louke of the Fabulous Flute Music Company have posted several videos on their Facebook page demonstrating body movements that naturally accompany phrases of various lengths and directions. These are meant to accompany their method book, THE FLUTE SCALE BOOK: A PATH TO ARTISTRY, but even if you don’t have the book (which has received rave reviews! ), the videos are still helpful to see, particularly if you need help understanding what to do with your body while playing, or your accompanist is having difficulty following you. To prevent tension that is caused by poor placement of the right thumb — bent right wrist, fingers having to support the flute to keep it from rolling inward, shoulder and/or elbow in uncomfortable position, etc. How do you know if you are achieving correct thumb position? 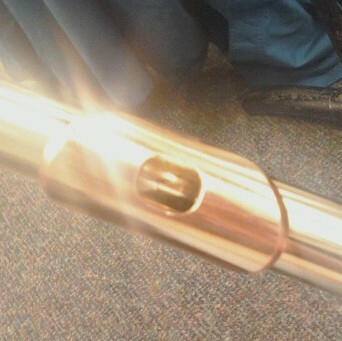 You should be able to hold the flute up with only 3 balance points: 1) the lip plate, 2) just above the first knuckle of the index finger on the left hand, and 3) the right thumb. If you can wiggle all of your fingers without the flute rolling toward/away from you, then you probably have the right thumb in the appropriate place (or at least close to it). Set a pencil on a table and pick it up with your right hand. Notice the gentle curving of your fingers and the relative straightness of your thumb. If your thumb is too far forward on the flute, your fingers will most likely be more claw-like rather than gracefully curved. Your wrist and the back of your hand should be generally in a straight line. If your thumb is too far forward (the flute resting directly on top of it, or it’s hooking around the underside of the flute body), your wrist will probably be bent down, and that will likely throw many other aspects of your playing position out of whack as well. Now there are always exceptions to the rule, and I suppose, for example, that there might be some people out there who have a longer thumb that may require them to place the thumb more forward (ie, more directly on the underside) of the flute than others. Examine your own position as objectively as possible, keeping in mind that we human beings generally resist making changes to fundamental habits such as embouchure and position, because it takes patience and persistence.